A mountain pass three hours south of Melbourne is a strange place to find the Scandinavian notion of heaven, but here we are. Walhalla is quiet, remote, and filled with birdsong and delicious deciduous trees that change colours almost as often as the sunlight that peeks through the gaps in the mountains around. You could be in heaven indeed, and in a sense you are in an afterlife. 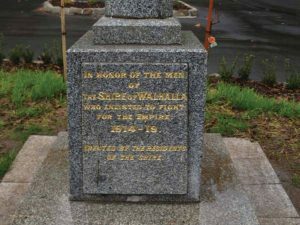 Because a century ago Walhalla was a smelly, belching, noisy mining town filled with 4,000 miners, all of them badly in need of a wash.
That was then and this is now. 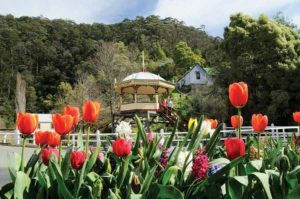 The pace and pressures of the world are a long way ago as visitors to the town settle in the huge array of walking and cycling tracks through the forest that blankets the Great Dividing range. Remote is the word. In the Star hotel in Walhalla can’t get Australian television. The one satellite channel they can get is from Singapore. You get the impression Michael likes it that way. Walhalla has that lost feel, as if time zones don’t matter here. You need only look at their World War 1 memorial to confirm your suspicions. “In memory of those killed in the Great War 1914-17” it says. There are no names on the monument, because they weren’t sure who was killed. It has the wrong date, because they weren’t sure about that either. They weren’t sure about anything in Walhalla. The gold rush came later than Bendigo or Ballarat. This was deep layer mining gold in ancient river systems, which meant that instead of individual stake holders they had big companies who employed diggers to mine their gold for them. They weren’t sure how much gold there was, so the town outlived the average for a gold town in the mountains which was five to seven years. “Nobody expected it to last 50 years,” Michael Leaney says. It even had the railway built all the way to Walhalla, three years before the gold ran out. The railway was then used to cart whole houses, pre-packaged, off to the next stop. A few years later there was nothing left. They sliced through the top of a mountain to build a cricket ground. Hit a six and you never find the ball. Walhalla never provided horses for the visiting team to climb the hill and slept in the clubhouse the night before they played. Folklore holds that they never lost a home match. Now Walhalla has eight residents, Mick the miner, Norm and Rhonda (the general store owners), Ian and Di the retirees from Melbourne, and my three hosts at the hotel, Russell, Michael and the chef. You can still pan for gold in the creek, as if the boom never happened. Colin, better known as Sheriff (after the time someone brought him a shirt from Texas), and his partner Rae-Ann will show you around the long mile shaft and tell you the story. They have reopened a section of the railway where you can ride. And in the cemetery they will show you the graves from the boomtime. The mines belched pollution, noise, smoke and caused every tree in the valley to be felled. Now the trees are growing again, the creek is clear and still and the poisoned valley is green and still. The gold in them there hills is m ore discernible as the colours of the deciduous trees change in the few hours of sunlight that make their way into the deep valley. On the nearby mountains, the snow gums are calling. Two overnight falls of 20cm have made this the best start to the Aussie ski season in a decade. Mount Baw Baw is pleasantly small, just seven lifts and a few t-bars and drags to convey skiers uphill. Val d’Isere it ain’t, but the key to skiing here is the entangled snow gum landscape, an amazing contrast to the spruces and firs of Europe and the Lodgepole Pines and Aspens of Colorado. Ski through these trees at your peril, they will give you a slap in the mouth. My hostess in the Australian Alps, Sallie Jones, drives me back through the ever earlier darkness. Bushfires were here. They didn’t harvest many grapes in the Yarra Valley this season. The vines are cut back to their winter state as we stop by to taste at Innocent Bystander vineyard. The bushfires raged through the neighbourhood and left a charred taste on the grapes, tragically burning some storage houses in Domaine Chandon. Chloe McDaid from Co Down shows us round the mock-Baroque splendour of Chateau Yering Historic House. The guide books will tell you how Phillip Island, Victoria’s signature attraction a few hours further south on the coast, is a great place to see wildlife. The image they conjure up is of birdwatchers, nature, serenity, solitude. Not so. Tonight I am going to the penguin version of a rock concert. Philip Island is wildlife as a stadium experience. About 300 penguins have decided to come back home this evening, and there are about 4,000 people here to see them. They don’t cheer and applaud and cal for an encore. But it is a close run thing. There is a designated kick off time (sundown), viewing stands, stewards, storyboards, gift shops, a tannoy commentary, and even a corporate box, where we were positioned with binoculars to watch what we could of the penguin parade before the light fades. There are better places to see penguins waddle home, like Bicheno in Tasmania and Kangaroo Island of Adelaide. But Philip Island is accessible and the organisers of this stadium wildlife event say the money will help them with conservation and research programmes. This is one of Australia’s signature events, a spectacle that has been going for decades so presumably the penguins are used to the glare of publicity – although thankfully all photography is now prohibited due to the number of penguins blinded by flashlight. In a sense these penguins are lucky, and have known nothing else for generations. There were 12 penguin colonies until the Europeans arrived and set fire to the island to clear it for sheep farming. They then trampled over the habitat until the 1950s when they started building the tourist enclosure. Some of them must think they have swum to Japan by accident, judging by the coach loads of Japanese. One visitor asks “can we eat them?” and nobody bats an eyelid. Eoghan Corry flew to Melbourne courtesy of Qantas and Austraian Tourist Board.